Throughout mankind’s evolutionary history, teachings explaining his origin, his purpose and his destiny have accompanied him in a form comparable to his understanding and the intellectual capacity of his time frame. From Eastern Traditions such as Hinduism and Zoarastrianism, and from the same root source which nurtured those religions, flowed the mystical teachings that were later compiled into the Kabalistic teachings and destined to be carried forward into the Western World through Christianity, which influenced many of the established religions in our world. At first only those of the highest order and intellectual capacity were given to understand the ancient teachings. It was to these individuals that the rest of mankind looked for interpretation and translation. Each time mankind’s consciousness moved into a new level or grade, new interpretations came forth. The result is that man has now reached the level of awareness in which he must integrate the teachings and through that integration achieve his destiny on Earth. The Kabalah has always been referred to as a “mysticism,” relating to the highest level of comprehension and understanding capable at any given point in time. The Kabalah became the basis of Rosicrucianism and Free­masonry on its higher level, and the root of Christianity and other exoteric religions on the lower. Many religions then, actually stem from Judaism. Thus, it was from Judaism and later, through Christianity, that the essence of Kabalah was carried to the Western World, where it is now available to all spiritual/esoteric students. The word “Kabalah” literally means “to receive.” What one “receives” is his own potential as that potential is developed through the spiritual growth process. One does not merely study the Kabalah, he becomes a Kabalist, at which time life takes on a new meaning. One then achieves dominion over his life and begins to follow his individualized purpose for existence. In essence, Kabalah is the Word of God. This Word and the integration of its Wisdom lead to Truth. Truth is not intellectual, nor can it be expressed by emotions. It is experienced within one’s total being as one literally becomes the Truth. In that becoming, one reaches a state of knowing which cannot be explained in words. Truth has always been with mankind, but mankind must open himself to receive it. Once man clears himself of the obstacles of conceptual thought, limitation and emotional reactions which have been programmed into his uncon­scious mind, then the Truth will be immediate, self-evident, and always with him. Truth will progress with him on his evolutionary journey. Our study course is presented in a universal sense for all spiritual students on the Path. It presents references to all the major religions of the world, particularly Judaism and Christianity since the course is primarily for the Western spiritual stu­dent. Efforts have been made to point out the Kabalistic tradition in both the Old and New Testaments. The course reinterprets the ancient teachings and also redefines present-day religious concepts into a new level of awareness applicable to man’s current growing consciousness. It aids one in establishing conscious as well as unconscious recognition and acceptance of his innate potential. Once recognition of that potential has been established, then the process of devel­oping it begins, as each individual continuously spirals on the repeated journey of awareness development. The subjective process of Pathworking allows integration and development of what was heretofore only known as objective or creative energies. It is through this process that one truly becomes a true co-creator with God, as well as fulfills the mandates of the Oracle of Delphi-”Be ye perfect” and “Man know thyself.” Kabalah: A Process of Awakening is one of the most complete and comprehensive studies available on the Kabalah. It is an in-depth, easily understood, two-year study program, with over 1,800 pages of text, diagrams and study guides. It is designed as a graduated system of study which works consciously and unconsciously to bring all levels of your being into bal­ance. Your increased awareness and understanding of God’s Wisdom and Truth opens your receptivity to stimulation and activation of your own potential. Your journey back to God in consciousness is hastened, while at the same time, you begin to lead a much fuller and more abundant life. The Kabalah brings forth and releases the potent energies contained within the Word of God since the beginning of this cycle of time. Stimulated by the intellect and awakened by the archetypal symbols and images which are the language of the unconscious mind, man begins to receive guidance from his higher Self and finds that his Inner and outer worlds begin to change. Through this study course you will experience the energy of the entire Tree of Life as your consciousness first expands in understanding and wisdom and then contracts into the center of your own True Being Some of the many topics discussed in exciting detail are the Tree of Life, the Sephiroth, the Hierarchy, the Archangels, the Angels, the Worlds, details of the Major and Minor Arcana, the Adam Kadmon, the Triads and Souls, Healing, Disease, Initiations, the complete Pathworking Process, including Solar Pathworking, the use of the overleaving of Jacob’s Ladder through the four Worlds, and many other topics never before published. Shirley Chambers, author and teacher, has an extensive background in esoteric/mystical studies. She is the author of two voluminous works, The Karin Kabalah and Kabalah: A Process of Awakening, comprehensive study courses taught at the Karin Kabalah Center in Atlanta, as well as available by correspondence to national and international groups and students. She is also the author of the popular book Kabalistic Healing, published by Keats Publishing, a division of McGraw-Hill. Shirley is founder and director of the Karin Kabalah Center, a spiri­tual/mystical teaching center, where she presents classes on the Kabalah and other related subjects. Ordained as a priest in the St. Thomas Christian Church, she holds a Masters in Sacred Theology and is Dean of the St. Thomas Christian Church Seminary. She has lectured and conducted seminars for many nationally known organizations such as Life Spectrums, Unity Church, Spiritual Frontiers Fellowship, Spectra, Aquarian Searchers, The Theosophical Society, Visions of Tomorrow and the Body, Mind and Spirit Expos. With characteristic clarity of mind as well as a great respect for all the ancient spiritual paths and traditions, her teachings and writings demon­strate the innate reasonableness of the Kabalah and other mystical teachings. When you enroll in the study course, you will be sent the first set of four lessons, each lesson to be completed on a weekly basis. You are to read each lesson at least four times a week (if not daily), do the meditation process daily and complete the study guides which accompany each lesson. The purpose of the study guides is not to test one’s memory, for the text is not to be memorized, but to ground the energies of the work as they are brought from the higher levels through the unconscious and then into conscious mind, finding manifestation in the written word. 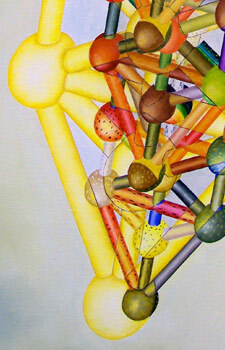 The Kabalah course is divided into three degrees. At the end of the Third Degree, you will receive certification of your completion of the entire three Degrees of Initiation of Kabalah: A Process of Awakening. The first degree is completed at the finish of Lesson Thirty-Six. Once it is determined that you have completed the study guides, you will receive certification for that degree. Of course, the study course may be completed without receiving certification, in which case it is not necessary to forward completed study guides, even though it is highly recommended that you complete them for your own benefit. While studying the Kabalah course, each student is personally assigned a counselor and you are given the name(s) and time(s) when a counselor may be contacted for help with any questions and/or problems you may encounter. Another purpose the counselor serves is that of a local center whereby energy from the Kabalah is cycled to and from the student as he completes the study and growth process. You may also email the Karin Kabalah Center at kabalah@mindspring.com. The class includes meditation (approximately 20 minutes), a lecture (approximately 60 minutes) and a reading of the lesson (approximately 30 minutes). The following day an audio file of the class will be e-mailed to all students. A set of four lessons at a time is mailed so that students will have the written materials prior to class. Each student outside the Atlanta class will be offered a free 40 minute consultation session each month, wherein they may ask questions or seek clarification. These sessions must be scheduled in advance.The monthly fee is $75 which includes the material, class recording and consultation. The energy to do this spiritual work requires a dedication and commitment to one’s own growth process, in that you must be willing to set your priorities in order to take time each day (approximately 45 minutes to an hour) for the study and meditation required for a true student or aspirant. If you are interested in formulating and acting as a coordinator for a group in your area, please contact the center.